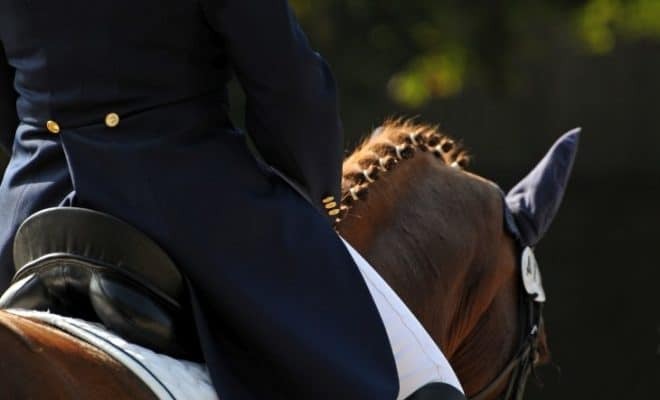 Home›Dressage Theory›How Long Should You Ride Your Horse For? How Long Should You Ride Your Horse For? That’s a good question, and the answer depends on several factors. Getting it right can mean the difference between a happy horse who enjoys his work and one who is stale and bored. Bored horses often seek ways of avoiding work, and that can create problems for riding at home and competitions. So, how do you strike the perfect balance between too much and too little work? Here are some tips and advice to ensure you get your horse’s workload just right. Schooling correctly builds your horse’s fitness and stamina so that he has the physical strength to develop more engagement and progress smoothly through the grades. Schooling allows you to practice individual movements from the dressage tests you’ll be riding in the arena in competition. Schooling is important for showjumpers too! That’s because dressage makes the horse a more balanced, obedient, supple ride. So, in a jump-off, you can make tighter turns smoothly and more quickly. 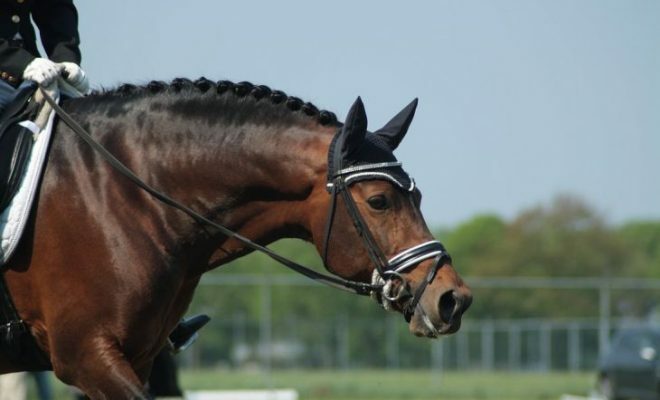 Dressage schooling can be very demanding for the horse, both mentally and physically. If you overdo it, you risk your horse sustaining injury. Too much schooling can lead to your horse becoming bored and resentful. 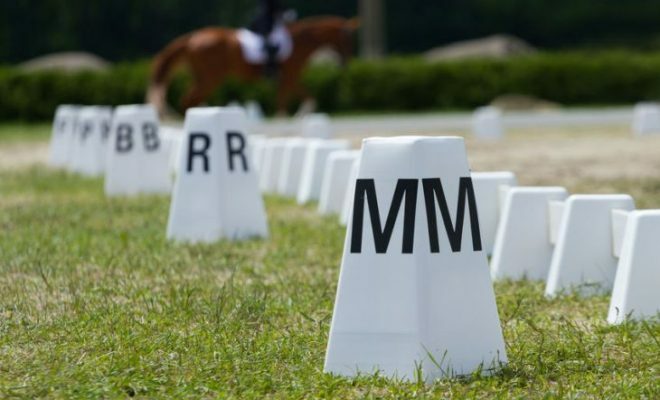 Over-practicing dressage movements can often lead to the horse anticipating what’s coming next during a test situation, which will lose you a lot of valuable marks. How long your schooling sessions last for depends on how experienced your horse is, how old he is, his temperament, and on what you hope to achieve. If you have an educated, older horse, you might not need to spend too long schooling him. It’s just a case of loosening up, working through the exercises you want to cover, and then cooling down and stretching. Lazy horses are usually better suited by a short, sharp schooling session a few times each week. Baby horses quickly become tired and sore. Keep schooling sessions short and have a clear educational goal in mind. Usually, 20 minutes is plenty long enough for a youngster. If you have a horse that is very “hot,” you might need to work him for a longer period before he settles and you can get some useful work done. How long you school your horse for varies from horse to horse. Time your schooling session using a stopwatch so that you know how long it takes to achieve that perfect “sweet spot.” That will help you to get your warm up time right at competitions. If you feel your horse tiring or becoming upset with a particular exercise, ride through something he finds easy, and then conclude the session. Always end on a positive note; there’s always next time. Hacking is a very useful alternative to schooling. Walking on the road helps to strengthen the horse’s muscles and teaches him how to balance himself, especially if you have some good hills that you can ride up and down. Also, hacking exposes your horse to lots of different sights and sounds. So, when you arrive at your dressage competition, your horse will be less fazed and distracted by the unfamiliar environment. You may find it beneficial to take your horse hacking for an hour or so several times a week, instead of schooling him. Alternatively, try going for a short hack before you school as a warm-up, or afterward to cool your horse down. Most horses enjoy jumping, even if their riders don’t! If you prefer not to jump while on board, try loose jumping your horse instead. Set up small grids with varied stride patterns between the fences, incorporating oxers and upright fences. 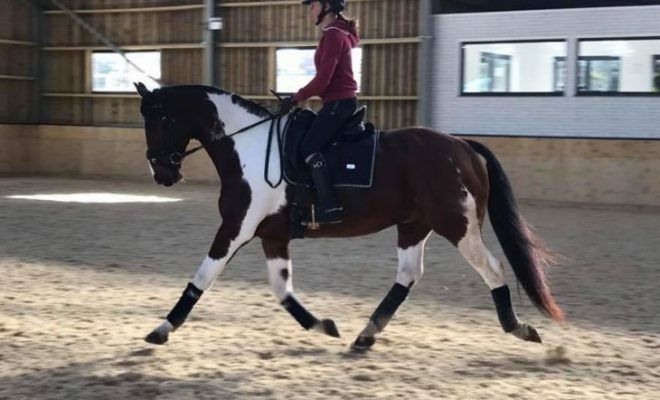 These exercises are brilliant for keeping your horse loose through his back, for building up muscle on his hindquarters, and for teaching him how to shorten and lengthen his stride to adjust his balance. So, short jumping sessions interspersed with hacking are perfect for building strength and stamina and for keeping your horse fresh and interested in his work. Jumping sessions should be kept short. Warm up your horse on the flat for ten to fifteen minutes, and then spend a further 15 to 20 minutes jumping him. Lunging is very useful as a form of exercise for your horse when you don’t have time to ride him. Lunging is also important for youngsters, as it teaches them to work in rhythm and balance without the encumbrance of a rider on their back. If the venue allows it, lunging can also be useful at a competition before you begin ridden work, especially if you have a horse that’s inclined to be over-fresh. However, lunging can also be very stressful on the horse’s joints, so sessions should be kept to a maximum of 10 to 12 minutes on each rein. 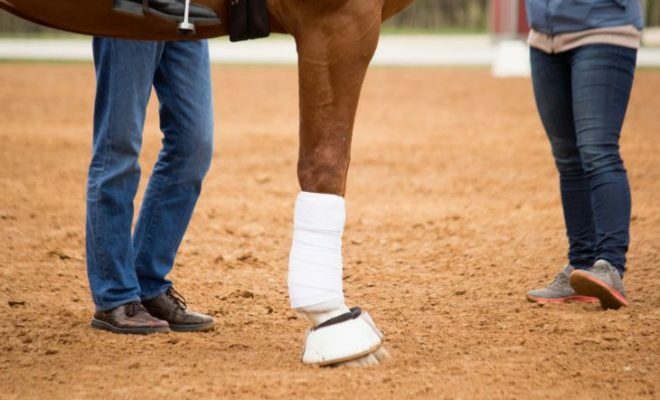 Change the rein every few minutes to avoid overstressing the horse’s legs and to ensure that his muscles develop evenly on both sides. Youngsters should not be lunged for more than 15 minutes in total per session to avoid injury. There are lots of ways of exercising your horse, both from the ground and in the saddle. To keep your horse fresh and enjoying his work, intersperse schooling sessions with hacking, lunging, and jumping. How long you ride your horse for depends on various factors such as his age, the type of exercise involved, and what you hope to achieve. The golden rule is not to overdo any form of exercise. If your horse feels tired and sore every time you ride him, he will quickly learn to resent his work, which is extremely counterproductive. How long do you ride your horse for? Do you have any tips on how to keep your horse fresh and interested in his work? Share with us in the comments section below. 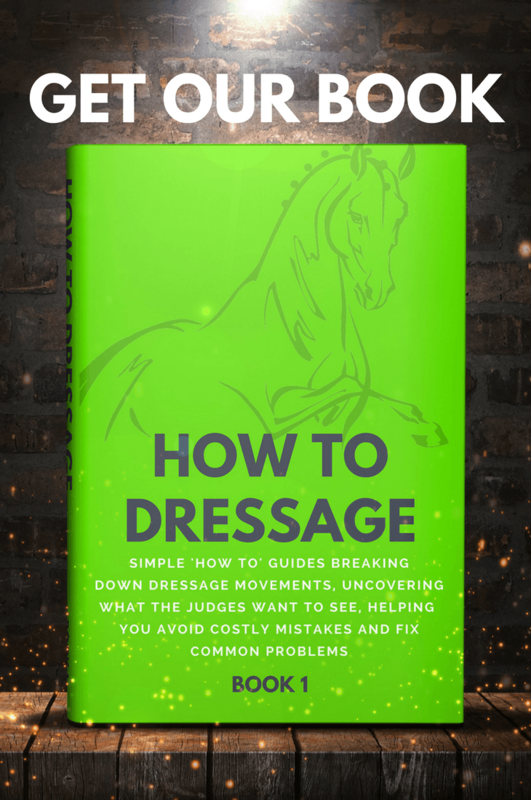 What is “The Correct Way of Going” in Dressage? 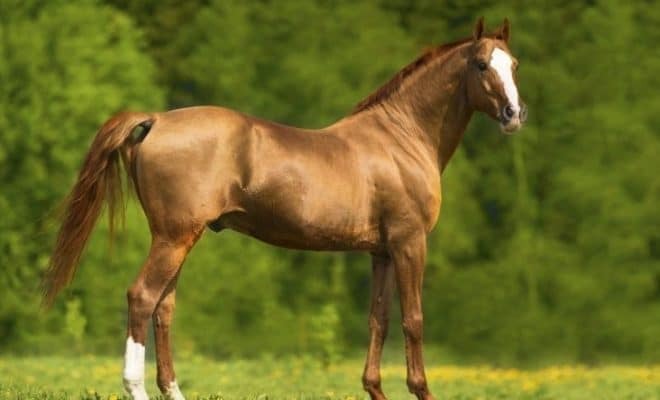 Does a Good Looking Horse get More Marks? What Does ‘Between Hand and Leg’ Actually Mean?